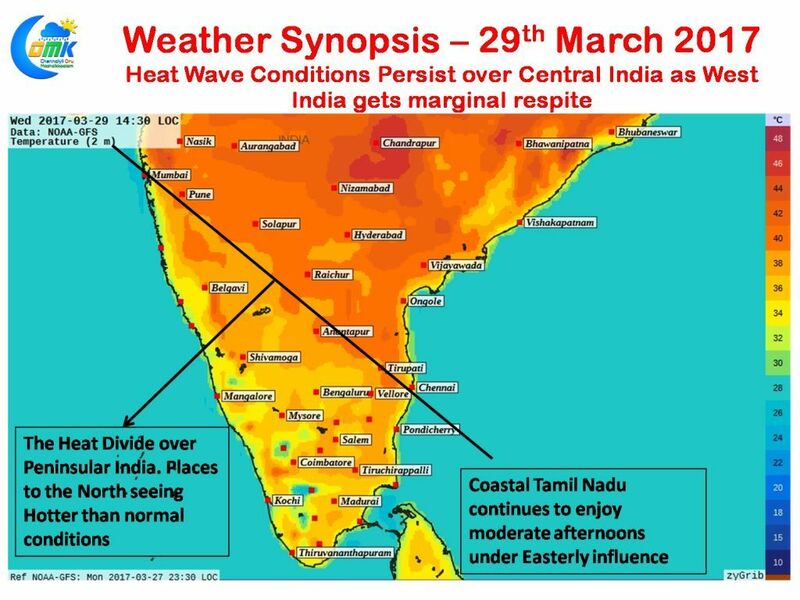 As many parts of India celebrate Gudi Padwa / Ugadi to mark the beginning of the new year heat wave conditions continue to persist over large swathes of the country. Yesterday saw Jagdalpur in Chhattisgarh along with Churu and Phalodi from Rajasthan record their hottest March days. About 30 places in the country recorded 42°C or higher yesterday heat wave conditions persisted. In an indication of possibly the slight Eastward shifting of the heat wave zone Jagdalpur in Chhattisgarh recorded the hottest temperature in India. Today could see temperatures slightly ease in the Western Parts of Maharashtra, Rajasthan and Gujarat. Though this is unlikely to be a drastic reduction in temperatures the extreme conditions could ease a bit with possibly better conditions prevailing over the second half of the day. The temperature charts for today further confirms the shift in Heat Zone from Rajasthan to parts of Uttar Pradesh while similarly things could get a little hot in Chhattisgarh & Odisha as well along the northern edges of Peninsular India. In what appears to be two different zones within Peninsular India parts of Andhra Pradesh, Telengana has been seeing scorching day time temperatures with many places in these two states recording 40 / 41°C while further south more moderate conditions have been prevailing. While the Northern edges of Deccan Plateau is coming under the influence of the continental land air from North India the southern parts are seeing more Southerlies / Easterlies keeping temperature under check. This is most obvious along coastal Tamil Nadu which saw Chennai Meenambakkam record the highest at 34.3°C.